Puff gathering is the reverse side of star gathering and it is made the same way as star gathering. Cut one 7in x 7in square and start marking your puffs as per graph above as for the Star gathering block. 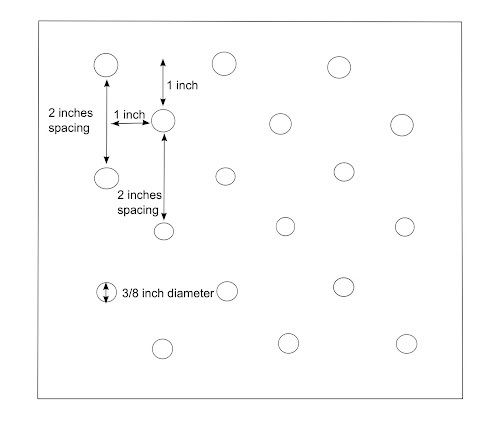 Adjust the spacing in the graph below, which I used for the star gathering block, to the following spacing: mark your circles at 1 1/4 inches instead of 1 inch and 2 1/2 inches intervals instead of 2 inches, ie add an extra 1/2 inch to each measure. Also I made the circles 1/2 inch instead of 3/8 inches but it will work just as nicely as using the spacing used in the graph below. Start stitching around the circle from the back of the fabric. When you end stitching around, pull the thread to gather the fabric making sure a puff is created on the other side. If necessary, hold the puff from the other side as you pull the thread. Finish with a double knot to ensure the thread doesn’t slip. When you have done all the puffs it’s time to stretch (not press) the square. If possible pin your square to the ironing board stretching the texture. Now, put the iron on the steaming setting and place it on top of the fabric without touching. The humidity and heat will be enough to help flatten the square. Let it dry. When dried remove it from the ironing board. Trim the square to 5 inches. Now stitch the border to the centre square. If you have a nice geometric print, you could use the pattern to guide you make the grid for the texture as I did (see picture). I used the pattern to stitch the puffs at regular intervals using the flowers as guides and stitching every two flowers. Polka dots or gingham would work well too. This is the 12th block in a series of 25 exploring texture in fabric. Oh my goodness!! You’re my new favorite site! I’m a school teacher, and I’ve been teaching a quilting elective for my 6th graders the past several years. You’re sampler is going to give me wonderful new stuff to try! THANK YOU!!! !